Which restaurant chain has worst drive thru? Drive thrus are a major part of the American dining enterprise, almost as old as restaurant chains themselves. So then which national restaurant chains consistently provide American consumers with the best drive-thru experience? SIGNUM for Restaurants has the data. The percentage of customers talking about drive thrus at restaurant chains over the last 4 years is climbing steadily across the industry. With an industry average of around 7.5%, the percentage of buyer conversations about drive-thrus is high relative to other restaurant topics. The next step of course is to look at the sentiment of the comments. Quantifind's SIGNUM for Restaurants uses machine learning to filter out the noise from online conversations and home in on only the signals pertaining to sales. 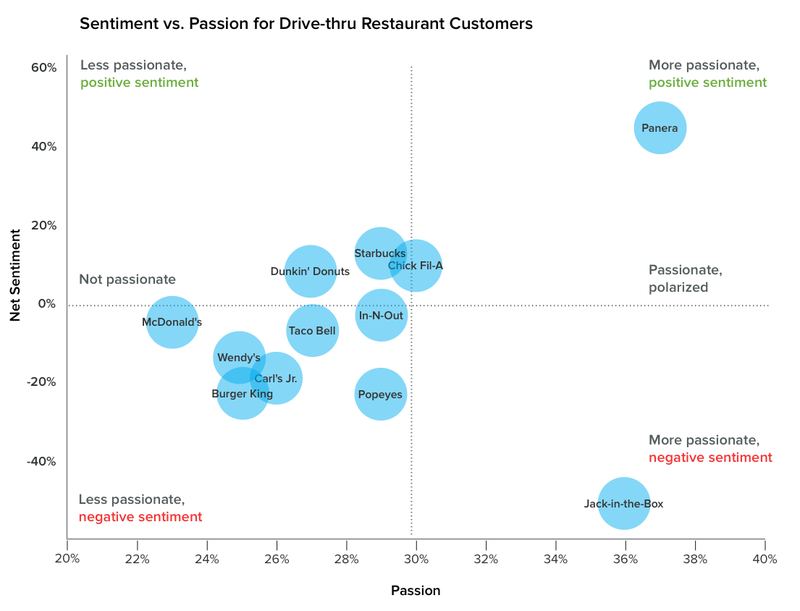 The data clearly shows that Panera offers the best drive-thru customer experience. Interestingly, one of the biggest drivers of this positive sentiment for Panera’s drive thrus are their very existence. Customers are unsure, as they drive up to a Panera, whether it will have a drive thru and are pleasantly surprised when they see one. The good news for Panera here is that people are clearly excited about getting served its food in their cars; the lukewarm news is that this positive sentiment percentage would likely show diminishing returns were Panera to start extending the service to all its storefronts. For Jack in the Box, the drive-thru problems center on the likely suspects: wait times, poor service, and dilatory behavior in the parking lots. 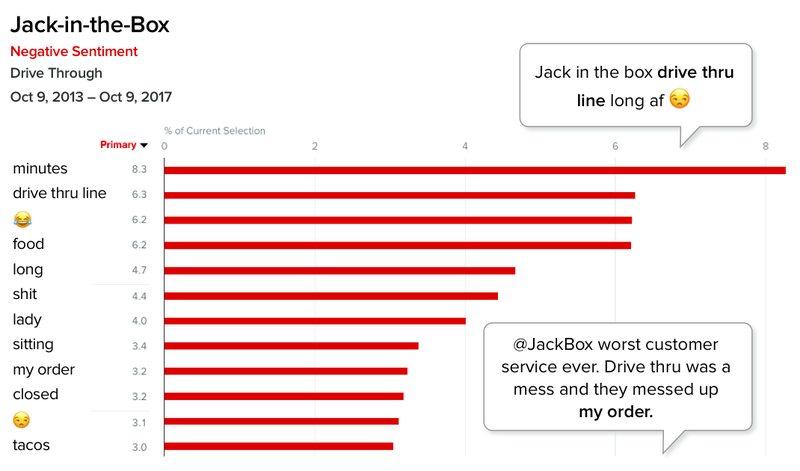 Jack in the Box's customers share the most negative sentiment, and feel extremely strong about it. This is likely something Jack-in-the-Box wants to address since drive-thru conversations make up a full 15.9% of all buyer conversations about the restaurant over the last 4 years. The conclusions are clear. Drive thrus are becoming increasingly important to customers across the QSR and Fast Casual spaces. Panera and Starbucks provide the best experience, while Popeyes and Jack in the Box provide the worst.